Hello my lovelies. I am back with another blog tips about how to choose responsive blog template for your blog. My blogging series has always been the most viewed out of all of the other posts on my blog, especially my top 5 free blog templates. I kid you not, I am still getting views for that said post up to this day! I am happy that you can benefit from my blog as I work hard to produce a quality post for my readers be it 2, 20, or even 200 people. So thank you so much and I really appreciate each view I get everyday. Now back to our main topic. I can see that a lot of Malaysian bloggers are trying out responsive template on their blog and I’m so happy seeing the growing numbers of blogs I stumbled upon who are using responsive template these days. Responsive templates are crucial if you want a mobile and SEO-friendly blog. Most of the internet users are using their mobile phone to surf the net so having a mobile-friendly template is beneficial for your blog growth. 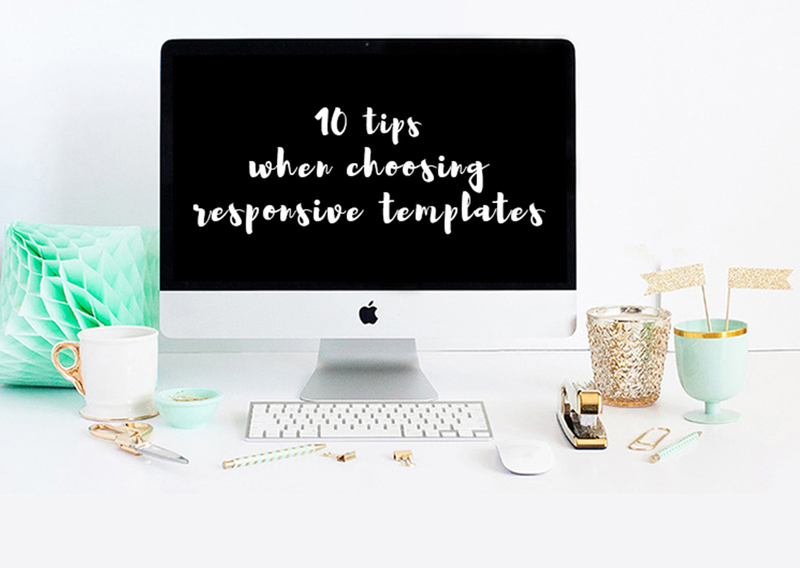 You don’t have to exactly follow all 10 tips that I provided but just pick a few that would help you in choosing the perfect template. Without further ado, let’s get on to it! … is important if you want to feature certain posts as it will be the first thing that your visitors see on your blog. Mainly used to attract attention to the posts with pretty pictures or engaging contents. One of the things that made me fall in love with my blog template is I have a choice whether to have my posts with or without read more functionality so basically I’m getting two sets of code from my template seller and of course I went with the auto read more because without the read more function, my blog would be messy. With auto read more, your blog is cleaner and your visitors can click on the posts they want to read without getting overwhelmed by blocks and blocks of texts and overflowing images. Self-explanatory. Most responsive templates come with their own set of social network buttons that suit their template style. It is important to link up your social networks so your visitors can follow you on your other social platform unless you’re one of those anonymous and mysterious blogger who prefers to be in the dark. Very important. I mentioned the importance of having a navigation system on your blog on this post. Your visitors can easily reach your other posts by navigating through the dropdown menu and clicking on different category of posts. Many responsive templates have this feature now. Some people might not like but I do because when I scroll down to the bottom of the page, I can still click on the navigation bar without having to scroll all the way back up. I browsed through many templates on Etsy everyday and I always click on the dummy post to see the comment section. Some of the templates I found are very exquisite but the comment section throws me off. I like comment section that is nicely spaced in between comments and each of the comments has its own border. I am very particular about these little things. You can see the example on my blog. For those of you who post pretty pictures on Instagram, you need an Instagram widget preferably at the bottom of your blog. It will look really nice especially with a white-themed blog. Unfortunately, I don’t use Instagram all that much. I don’t even have the app on my phone. … is really, really important on every blog. It attracts visitors to click on your other posts related to the one they’re reading and this will also make them stay longer on your blog because of the recommended posts. Find a responsive theme with a nice popular posts widget. When I go to a blog, I want to see their popular posts so I know what type of posts that are getting the most views on that blog. It’s always interesting to see other blogs’ popular hit. I don’t know how to explain this but it all depends on you and what attracts you to use a certain template. Personally, I like clean and organized blog so I get a theme that is well-structured in terms that the post area, navigation menu, sidebar, and even footer are symmetrical and up to my expectation. It might look good on live preview but not so much on your blog so if you’re planning to buy a template, please make sure that you are 100% happy with how it looks because what you see is what you’re getting.